I remember first having thoughts about living off the land when I was six years old. I was sitting at the kitchen table with my brother and a friend, and I told them I wanted to run off and live in the wild. I’d eat wild plants and make milk, just like a cow. Following that statement, I went outside and gathered some grass, brought it in and mixed it with butter to help it slide down and then started chomping away. I was in the process of trying to swallow my first bite and smiling with tiny bits of grass sticking to my teeth, when my brother said, “If you are really able to make milk, how are you going to milk yourself?” I looked down at my body trying to determine what might be comparable to a cow’s utter. I have never been well endowed in that manner, so you can imagine what I was like at the age of six. That was the end of my endeavors at that point. Luckily, when I yanked that grass out of the yard, I didn’t yank up anything poisonous along with it. Next, at around the age of fifteen, came my Euell Gibbons Days. Gibbons in the 70’s was like Bear Grylls is today, but he didn’t scale cliffs, or bite the heads off insects. Instead of risking his life out in the extreme wild, he preferred to concentrate on those things that could be found on an innocent family hike. In fact, the book I read, Stalking the Wild Asparagus, was about as dangerous as it seemed to get with him. Lions and tigers and wild asparagus, oh my! Back then, I read that book and tried dandelions, not hard to recognize, and found that the roots might be edible, but they sure were bitter, and well, I tried the flowers and the leaves, too, and I guess you might say I was unimpressed. I didn’t spend much more time tasting wild leaves and flowers after that, but I feel drawn back to different former interests every so many years, so here I am again, forty-some years later, and I’ve been thinking of what type of edible plants might be growing in my yard. After all, you never know when you might find yourself in abject poverty, or more realistically, hiding out from the living dead during the zombie apocalypse and being forced to live off the land. But since my days of eating grass and imitating moo-cows, I’ve become a bit more aware of the dangers of eating the wrong plants. Maybe it’s because I saw that movie “Into the Wild” a couple of years ago. The movie is based on the diary of Christopher McCandless, a guy who decided to live off of the land in the Alaskan wilderness. He apparently did well for quite some time, but at the end of the film he died because he ate the wrong kind of plant. Needless to say, after seeing that movie, I became extra paranoid and did further research to find that there are lot of plants that look very similar to one another; some that are edible and others poisonous. So when I realized that I had finally succeeded in transplanting and growing what I assumed to be milkweed into my garden, I was happy because I hoped it would draw some monarch butterflies to my garden, but I also remembered that parts of milkweed are supposed to be edible and even considered “good-eatin’” by some. I thought I might go ahead and try some, but felt that I should make sure it really was milkweed and not some poisonous lookalike. 1. Milkweed leaves are smaller ascending the stalk, larger lower on the stalk. Yep, mine are! Dogbane leaves are slightly larger ascending the stalk, smaller at base. 2. Milkweed has fine hairs on the stem and leaf bottom. Yep, mine do! While Dogbane stem and leaf surfaces are smooth. 3. 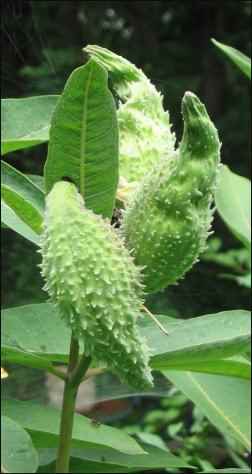 Milkweed has few, if any, buds on its leaf axils, while Dogbane has many leaf axils with buds. Mine did have some small buds on the intersection where the leaf’s stem branches out from the main stem. Is that the axil? I looked it up and yep, that’s the axil, but at the same time, it didn’t have lots of them. And how do you define “lots”? 4. Milkweed leaves do not squeak when rubbed together. 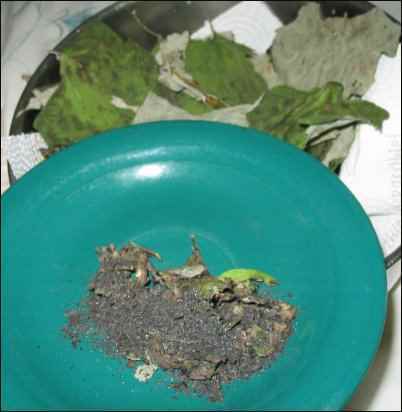 Dogbane leaves squeak when rubbed together. This part is debatable. First, I rubbed and didn’t hear a squeak; then I rubbed again and thought I did. Then I wondered if it was because the leaves were wet, or because I rubbed them too hard or too lightly. Was it a squeak or a moan? I gave up on that one. 5. Milkweed exudes lots of milky latex sap, while Dogbane exudes a little bit of milky latex sap. Um, again, the measure of the amount is all relative and I didn’t have any dogbane to compare it to, but I did see what I assumed to be “lots” of milky sap. 6. 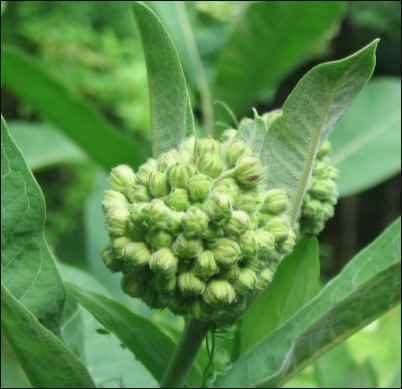 Milkweed stalks are hollow and green inside, while dogbane stalks are solid and white or cream inside. Yes, mine are hollow, although not as hollow as I expected (thick walls). 7. Milkweed stalks are slightly squared in cross-section, while Dogbane stalks are round in cross-section. Yes! Yes! Yes! While I always thought of the stalk as round, once I cut a piece off and looked at the cross-section, I noticed it really is square. If you have ever wired something electrically, you’ve learned that there is a very slight difference in shape between the positive and negative side of an electrical cord. It’s sort of like that; subtle unless you are looking for it. 8. 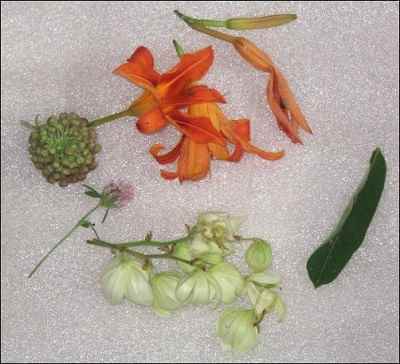 Milkweed has green stems while dogbane has red stems. Yes! They are green and they are square. Did I really have to go through all of that other identification? Well, better safe than sorry I suppose. The tender young shoots when they are about eight inches high, the leaves, the flower buds, and the pods that come after the blooms have expired, are all said to be edible. The trick, apparently, is to catch the green pods before they get to the silky stage (2” or smaller), and the youngest leaves are also said to be the most tender. If you open a pod and the seeds and silk still look moist, it is fine, but if the seeds and silk are starting to dry out, or if any of the seeds are turning the tiniest bit brown, the pods will be tough. Another test is to give the pod a gentle squeeze along the seam. If it pops open easily, it’s probably too mature to be tender enough to enjoy eating, but a great way to spread seeds in your garden. I was warned by one source that milkweed needed to be boiled multiple times with the water changed each time in order to leach out all bitterness. So I collected some leaves and flowers and boiled them three times, emptied the water three times, and didn’t taste the slightest bit of bitterness. The leaves got limp like cooked spinach and pretty much tasted like it, too. The flower buds became limp too. Then, I read elsewhere that milkweed isn’t bitter at all and is in fact sweet tasting. With that source there was no talk of bitter toxins to boil out, so I plucked another leaf from my milkweed plants and nibbled at the end of it. It tasted…. like a leaf! Gee. Then I plucked a tiny flower off of the clump of flower buds. The flower tasted pretty much like you would expect a flower to as well, except that for some reason I was hoping it would be a little crunchy, since some suggest it is good in salads. Nope, not crunchy, not flavorful, just kind of like biting into a tiny piece of tissue paper. So I decided to follow the directions from that article and quickly dip my flowers and leaves in boiling hot water to blanch them, then dip them in a beer batter and fry them. What did I find? That you could probably fry horse manure in batter and it would taste good, because, after all, it’s really just the batter we like—whether it is the crunchies at Long John Silver’s or the extra crispy crust at Kentucky Fried Chicken. I deep-fried milkweed flowers and leaves, along with some daylily flowers because I was definitely sure of their identity and edibility, and they happened to be blooming at the same time. Something I found about batter-frying the daylilies was that it would probably have been best to remove the stamens. Not that anyone says they are poisonous or anything, but when you fry the flowers, the stamens come out looking like black spider legs peeking out of the center. Of course, it might be fun for Halloween. I found that daylily flowers are pretty good for holding the batter, and they taste good because the batter forms a nice crunchy crust around them, but they don’t have any taste of their own. The milkweed flowers on the other hand, soaked up the batter in and around all of the little individual flowers and had a sort of spongy quality when fried—crispy on the outside and spongy on the inside. I liked it, and there was a faint broccoli taste. I’ve found myself craving that unique combination of crunchiness and sponginess later on and felt the temptation to pick the last flowers of my six milkweed plants for the pleasure of having them again, but decided to leave them for the monarchs. When I tried the leaf, it seemed only like a structure to hold my batter and didn’t have much taste of its own, but I left one leaf on the plate uneaten and sampled it later after it had cooled to room temperature. That is when it actually had some flavor. So through some experimentation I have found that, although they may be edible, many things aren’t necessarily all that good, unless you have oil or butter, flour, eggs, and salt to dress them up with. But then, that seems to be true of a lot of things, so I guess I might spend some of my zombie avoidance time, growing my own wheat, stealing eggs from wild birds, and chasing down deer for milk to make the butter with, or would it be easier to make vegetable oil. How do you do that? Squeeze a cornhusk? And actually, what I made was a beer batter, so I guess I’d have to grow some barley and hops too. But beer keeps well, so maybe I’ll just start stocking up now. I did some research on salt substitutes and found that dried and burned coltsfoot leaves can provide a salty flavor, and boiled hickory roots leave a black salty tasting powder. 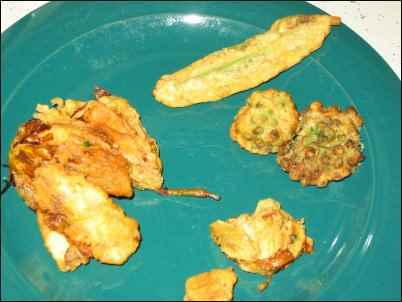 I must admit though, that later in the season, when the milkweed pods appeared, I was on a diet and thus didn’t want to use the batter and frying method. I brought in a pod, which had matured to a couple of inches long, but wasn’t old enough to have turned into fluff, and I cut it open. Inside, I found a tender core that tasted sweet and vaguely familiar. I only ate a bit, because it is best to try a small amount and wait to see if you have any adverse reactions, even after going through the entire visual identification process. But for days I kept craving more and wondering what that taste reminded me of… and then it hit me. Those little baby corns that people put in salads and Chinese food… tt tasted just like them. And now that I know they don’t upset my stomach, I’ll be having some really good salads next season. To make the batter, mix up 1 cup beer, 1 cup flour, 2 eggs, salt, and whatever other spices you like. Mix it to a smooth consistency, adding more flour if it seems to need to be thicker or more beer to thin it. Flop your flowers or leaves around in it to cover and then deep fry them until golden brown. I guess I should mention that the main reason I wanted milkweed in my yard was to attract monarch butterflies. Monarchs hang around milkweed because their larva will only eat milkweed, and milkweed in turn, makes them taste bad to birds; so this food which nourishes them also protects them from predators. When birds see bright orange butterflies with black stripes they instinctively know that these will taste bad and thus ignore them. Another interesting fact I always mused over during my childhood butterfly-collecting days is that the Viceroy Butterfly does not eat milkweed, and does not taste bitter, but it is orange with black stripes, so the monarch’s reputation protects the Viceroy as well. Sort of like wearing leather and studs to look tough to ward off bullies. Over the years people have used milkweed for a host of other purposes as well as attracting beautiful butterflies to their gardens. It has been used as filler for pillows for people who are allergic to chicken feathers, and during World War II it was used as filler for life jackets because of its buoyancy (it is said to be six times more buoyant than cork). Early Americans carried it as tinder for fires, twisted the stems’ tough fibers into rope, and used in various medicinal concoctions. 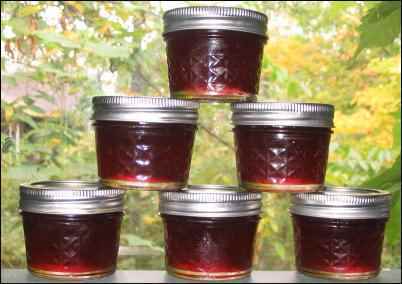 Its sap is said to cure warts. I wish I had a wart to try it on. 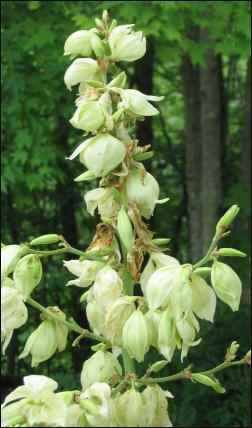 In addition to the obvious choices such as blackberries, crab apples, and cherries that I have growing on my property, I have also found that certain parts of the Yucca plant (known locally as rock lilies) are edible, but with this plant you must distinguish between which parts are edible. While we sometimes see Yuca (one “c”) roots sold in the stores, these roots come from a tropical plant which looks nothing like the North American Yucca, and the Yucca (2 “c”s) roots are not edible, but the flowers, young pods, and seeds are. From what I’ve read, it is still best to cook a little, try a little, and then wait a little to be sure you don’t have an adverse reaction. I also have numerous wild grapevines growing on my property and on a trellis near my porch. The grapes turn purple in the fall, but are very small and have a large seed in the middle, so they are best used for jelly. Just boil them, sift through cheesecloth to remove the seeds, and then follow the recipe on the pectin box. And alas, I am currently trying to learn to weave the vines into baskets. Of course, one more use for grapevines if necessary, is to obtain water in a pinch. In the most recent episode of “Naked and Afraid“, they cut the vines and sucked from them like a fountain. Fortunately, I’m rarely naked and almost never afraid… but that is because the zombies haven’t arrived yet.